SPOT.ph doesn't cut corners on our favorite panaderia goodies. Which ones are your favorites? Sure, man can't live on bread alone but the pan de sal, along with other panaderia goodies, have always found their way to the Pinoy breakfast or merienda at least once. The local bakery or panaderia is a familiar sight in many Manila neighborhoods, with its glass counters and the warm aroma of bread drifting from the ovens at the back. The bread sold here are simple, almost crude, but comforting. The panaderia started out as the royal bakeshop of the Spanish government in the 17th century. In The Governor-General's Kitchen, food historian Felice Sta. Maria writes that The Royal Bakery in Intramuros catered to Spaniards who longed for bread from their homeland. The wheat flour were sourced from China and baked by Chinese bakers. By 1880, nine bakeries were established in Intramuros, Sta. Cruz, Quiapo, and Binondo. It grew to 23 all over Metro Manila by 1921. The panaderia sold breads, biscuits and crackers alongside pies, cakes, pastries, and candies–a diverse selection that fully utilized the skills of the master baker or maestro. Native tuba wine was substituted for sour dough. During the American period, baking powder and yeast were introduced, as well as the use of baking sheets and automatic slicer. The breads we have now come to love reflect the creativity of local bakers, for not only could they create a multitude of breads out of a single recipe, they could also recycle unsold breads into puddings and fillings for the next day's wares. For both panaderia and buyer, it's convenient and economical. 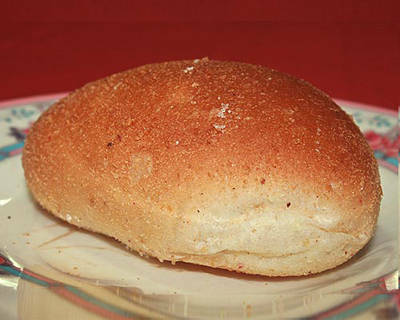 The Bread: The ensaymada is a brioche-like bread. This coiled bread is light, fluffy and sweet. Butter is spread on top then sprinkled with sugar and grated cheese. 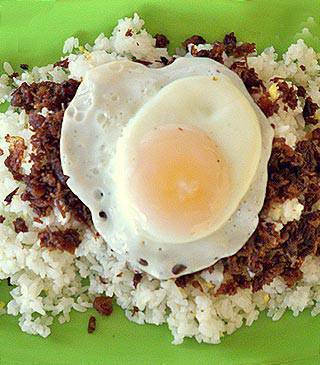 Cheap ensaymadas tend to be dry and topped with margarine, sugar and stringy cheese. Origin: It is derived from ensaimada, a yeast bun made in Majorca, Spain with pork lard. It is traditionally baked for festivals and celebrations. 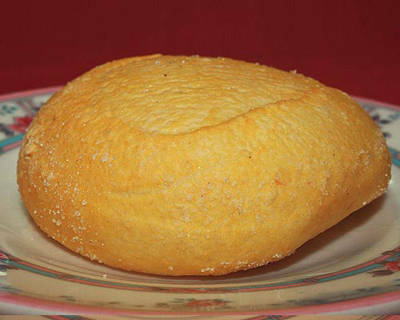 Also known as Pan de Mallorca in Puerto Rico. Interesting crumbs: Sta. Maria notes that the original ensaymada was merely dusted with powdered or granulated sugar. 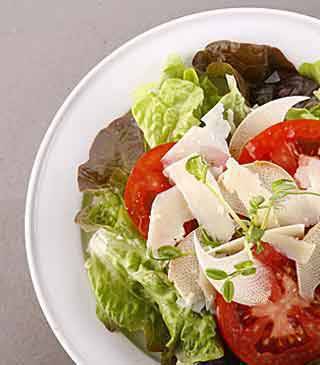 Grated queso de bola was added before World War II. 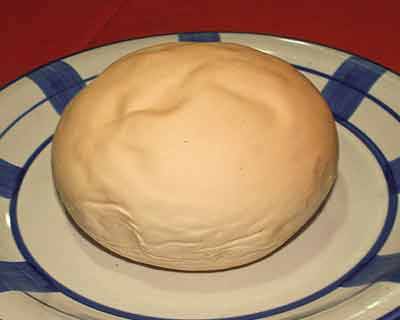 The combination of salted duck's egg and cheese were introduced later on in the ensaymadas of Malolos and Barasoain, Bulacan. The Bread: This is a yellowish soft bread with the traditional split in the middle. Some commercial monay no longer have the suggestive marking on top and are pale in color. Origin: Monay, according to Gilda Cordero Fernando in Philippine Food and Life, was originally called pan de monja (or nun's bread). It "evolved into the racier monay," which in colloquial Tagalog refers to a woman's privates. Interesting crumbs: The mother of most Filipino breads, the dough for monay transforms into different breads, depending on the water content, proofing (rising of the dough) and baking time. A master baker can whip this dough into different forms and degrees of softness–from the hard monay, pinagong, putok, soft and chewy monay, and the soft and fluffy kind you can slice and make as sandwiches. The Bread: Made from monay dough, the putok has a crown on top instead of a split. Its texture ranges from semi-soft to rock hard. The top is brushed with a milk glaze then sprinkled with sugar. The ridges acquire a golden brown color in the hot oven while the rest of its body remains pale to pale brown. 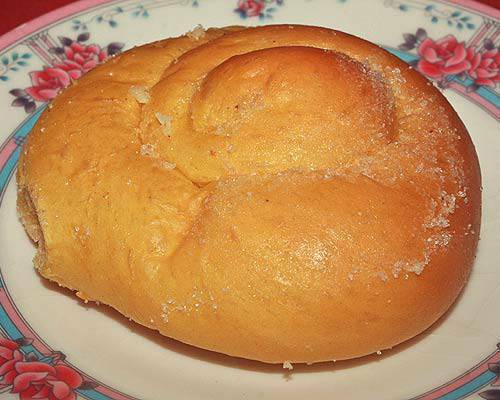 There are some panaderias, however, that have put their own spin on the putok, placing indentations on top of the bread instead of the traditional crown-like top. Origin: The name refers to the characteristic split on top of the bread. Interesting crumbs: The putok is more compact and dense than the monay because of shorter proofing time. To make the traditional ridges, the baker clips the top with a scissor or a sharp knife, forming an "x" which later splits and expands during baking. 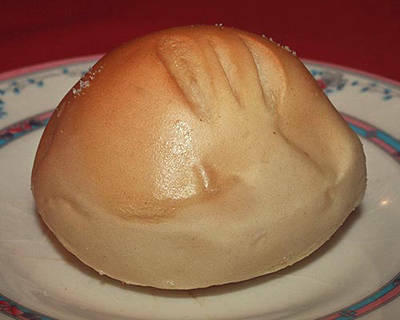 The Bread: The pagong (or pinagong) is a turtle-shaped bread, with a sweet and milky taste, a dense texture and a crunchy shell like the putok. Origin: The pinagong traces its roots from Sariaya, Quezon where it's considered a must-have pasalubong. It spread to nearby towns and to Metro Manila where bakeries render their own vision of its turtle-ness. Interesting crumbs: Usually, this bread has a flat bottom and a curved top, like the turtle's shell or carapace. On both ends are protrusions, to mimic the head and the tail. The shape varies depending on the baker and the area. In Malabon, the pinagong has an elongated shape (tail and head are of the same length); its shell has three ridges. Another version is more compact and exact, with just a hint of a tail and emphasis on the limbs on the sides. A crude version focuses on the outline and the three ridges. The Bread: Sputnik is a baby monay, shaped like a golf ball but with a very smooth, light brown crust and a nasty gash on one side. Sideways, that split looks like a mouth ready to chomp its opponents. Inside, the dough is pale and slightly dense. It tastes less sweet than putok but is more chewy and softer. Origin: The bread is named after the series of robotic spacecraft missions launched by the Russians in the late '50s–The Sputnik Program. Sputnik the bread also has the same spherical shape. Interesting crumbs: Other bakeries call it PacMan, a 1980s iconic video game, because of the "mouth" on one side of the bread. The Bread: The local cheese bread is a commercial soft pan de sal but smoother, its surface encrusted in sweet cheese granules instead of breadcrumbs. The interior is soft, almost dry and denser. 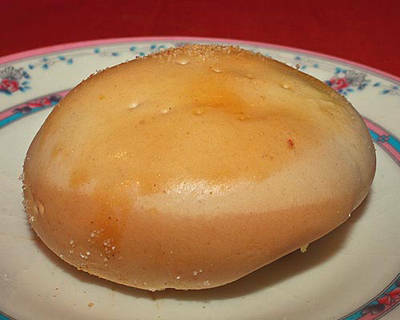 Another kind of cheese bread resembles a small soft monay with a stick of ordinary cheddar cheese inserted in the middle. Origin: I remember consuming a lot of this bread sometime in the '90s when it can be brought in packs at the local supermarket. In contrast, the monay-cheese bread is available in panaderias and best eaten hot. Interesting crumbs: The cheese bread with the granules comes in regular and mini-me sizes. The best kind has a moist and fluffy dough and plenty of cheese. The Bread: Kalihim is a soft bread with a bright red filling peeking out of its folds. The texture of the main bread is soft and not too sweet. Also known as pan de pula, its filling is sweet and smells of cheap vanilla. Origin: This bread is known by other quirky names. In Tondo, they call it pan de regla (because it looks like a, er, folded used sanitary pad). In Marikina, it's sold as bellas. Quezon City residents happily munch on their pan de red or floorwax. In Pangasinan, it's a more idyllic kabukiran while in Bicol, the bread is ligaya or maligaya. Interesting crumbs: The red filling is actually a thin bread pudding made from stale bread, milk, eggs, sugar, vanilla and lots of bright red food color. It is then wrapped in the main dough, pricked with a fork and baked. 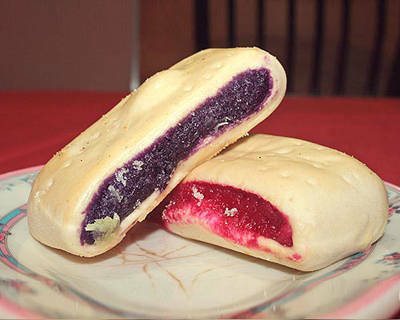 Other variations include ube and pineapple. 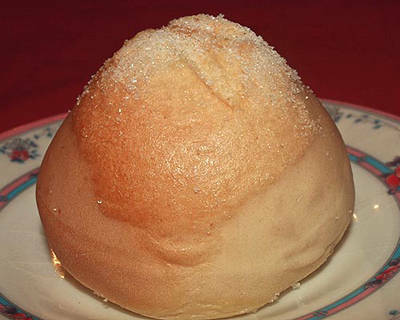 The Bread: A soft round bread roll with a sweet coconut filling. Some versions look like dinner rolls with shiny brown tops while others are pale all over. Origin: Pan de coco gets its name from its most crucial ingredient–the coconut. Other countries have similar pan de cocos, some mixing the coconut into the dough while others use coconut milk. Interesting crumbs: The best pan de cocos have the perfect ratio of bread to filling. The grated coconut and sugar melts into some kind of a tropical caramel. Some adore this gooey filling while others find it too sweet. 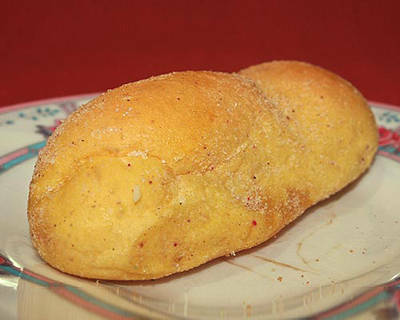 The Bread: A soft pan de sal-type bread shaped like a crescent roll with a sweet filling and a sprinkling of breadcrumbs on the outside. Origin: The name is a nod to its Hispanic roots though culinary books do not provide any historical context or an evolution of a similar product. Interesting crumbs: The filling spread on the dough prior to baking is made from breadcrumbs, butter, and sugar. The Bread: Pan de sal is a Filipino bread staple, our ultimate tinapay. No bakery survives without selling this small round, dark brown bread rolled in breadcrumbs. Origin: The pan de sal literally means "bread of salt," referring to the pinch of salt on the dough. 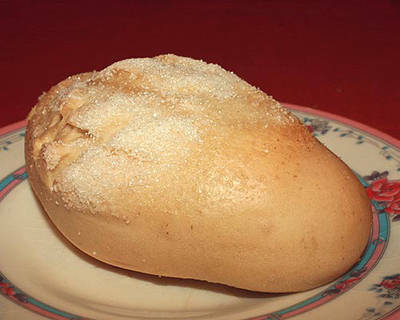 Two kinds of pan de sal were sold by bakeries in the old days–the regular kind and the traditional pan de sal de suelo. The latter is baked directly "on the oven's red brick floor," writes Sta. Maria, resulting in a crisp crust. Cordero-Fernando says it was "of kingly size, with hard crust cracked on top." Doreen Fernandez says it was also known as pan de sal na putok especially in the provinces, in relation to the cracked top. Interesting crumbs: To get the authentic pointy top, the dough is formed into a long log (like a "baston" or cane) and cut into uniform sizes then rolled in bread crumbs. The cut side is placed on the pan face down so when the bread bakes, that cut side (called "singkit" by local bakers) expands. 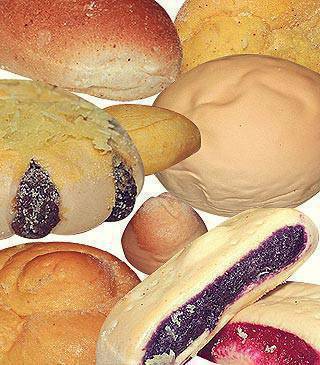 SPOT.ph wants to know: What's your favorite panaderia treat?